Following the UK’s Brexit vote, the centre of the EU should take note that there is a decent majority of British people, including a currently disenfranchised younger generation, who have embraced the European ethos, writes Charles Collins. Charles Collins is a British-European citizen who works as an architect in the UK. Given the opportunity, young British people would have worked hard to build on the institutions of peaceful and economic cooperation between the different cultures of Europe, with a collective desire to improve the lives of all of Europe’s citizens. 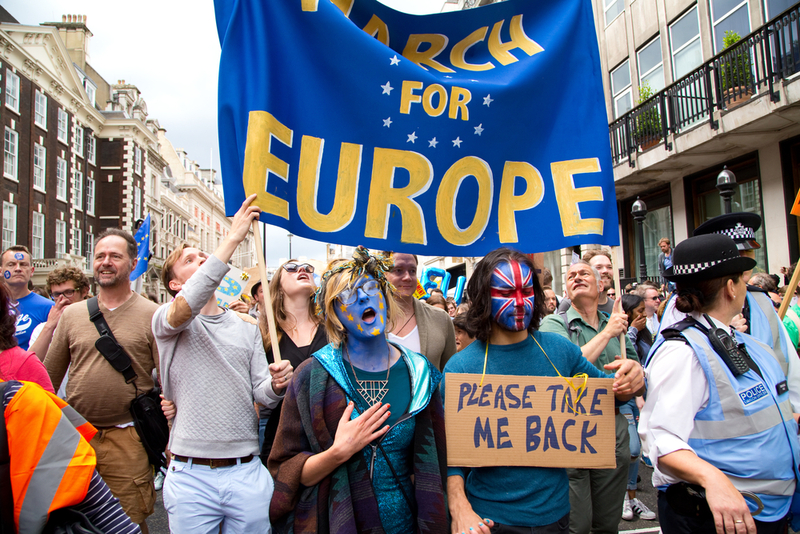 They should not be denied the opportunity to make their contribution to a peaceful and prosperous Europe for another 40 years, forced only to sit back and watch all previous efforts degenerate into a squabbling meltdown of bitterness and eventual disintegration of the EU. The EU should now encourage all and every mechanism which would allow the British public to take a step back, pause and take a new better informed look at what outcome they really want to see. They should also acknowledge that the small relative majority who voted to leave did mostly out of protest votes against the British/EU political system. They voted without any thought for the consequences of achieving a leave vote from the EU. They were not necessarily voting to leave the EU. They were just using this opportunity to register a protest vote. The general feeling is that many voted this way thinking that Remain would win anyway and certainly did not vote knowing or intending the consequential meltdown that has followed. This is not to disregard all of those who voted exit. Clearly large numbers voted exit for their own reasons, including those who have expressed concerns relating to a rapid increase in migration, resulting in disproportionate pressures on local resources. These were arguably predictable reactions to concerns over such movements and the inability to accompany these with equally rapid improvements in infrastructure and the allocation of appropriate and timely resources needed to cope with such movements and to help reduce friction. There should be a sensible measured mix of migration and resources. The EU should reflect on their offer of a deal to the UK prior to and voted on in the referendum. Free movement of people should be accompanied by a shared responsibility for managing matched resources needed. This is not a time to castigate a nation for its expressed opinion. The British people should also not now go on to be punished for the rhetoric a few nasty individuals. The EU should now consider a pragmatic approach to the developing situation for all our sakes. We all have too much to lose. ‘’There but for the grace of God go I”: Ask the same question anywhere in Europe and you could easily get the same answer! We all ignore this fact at our peril. We simply cannot allow this one result to turn the United Kingdom and Europe against each other, or for more hatred and intolerance to be spread. We are all better than that. We should all now step back from the brink and help each other to move forward with a reinvigorated EU which simply concentrates on achieving the laudable tasks of creating a peaceful existence and economic stability for all its citizens without creating unnecessary divisions. A bigger example of pro EU propaganda it would be hard to find, we knew why we voted the pointless EU but it is interesting to hear the lies and insults from the loser remainers. The reality is the British people looked at the Brussels created migrant crisis, Euro crisis, banking crisis, agricultural crisis and democratic deficit crisis and they said NO to your flag, No to your anthem and NO to your European experiment. Sadly I think the E.U. needs a couple more shocks before the collective will can emerge to fundamentally rethink how things are set up. I hope that happens while the UK is still a member and a rethought Europe could be put to the electorate. Where did the author find his facts? This reads as though it was written by someone that has no idea about the truth and only wishes to impart his opinion on anyone stupid enough to listen. The majority of the UK did not vote to protest, we voted to leave. We are not bad people, we are proud people that know that we are capable of running our own affairs without needing a federal state to oversee us. We are people that believe in ourselves and are prepared to take responsibility for our own actions. The actual truth is that a much higher number of people would have voted to leave if the remain campaign had not scared many people with tales of how the economy would collapse if we left. I do not blame people for voting to protect themselves but it is a great shame that people do not see that remaining in the EU is only a short term solution that will only last until the inevitable collapse of the union. I (and we) are not anti-Europe at all. I have just come back from 8 weeks working in Germany with guys from Spain, Italy, Belgium and Netherlands and I love Europe. But, I do not like the EU and the guys I worked with are very much of the same opinion. Whilst we may of been the first to seek and find our freedom we will not be the last.